The new chairwoman of the Scottish Police Authority has said she "takes issue" with claims the police service is in crisis. Susan Deacon begins her role at the body which oversees the workings of Police Scotland on Monday. She told BBC Scotland she wants the SPA to drive change and improvement within the force. It comes as seniors officers are being investigated over bullying and misconduct allegations. 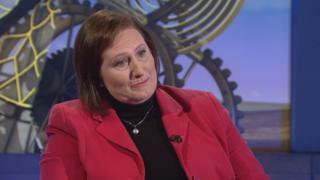 In an interview with the BBC's Sunday Politics Scotland programme, Ms Deacon also said she wanted to improve public and political trust and confidence in the SPA, which she admitted "has had a fairly bumpy ride over the last few years". Scotland's top police officer, Chief Constable Phil Gormley, was placed on "special leave" in September amid allegations of gross misconduct, including claims of bullying. Last month, Assistant Chief Constable Bernard Higgins was one of four officers suspended pending investigations after "a number of criminal and misconduct allegations" were made. They include a claim that the force firing range was used for unauthorised purposes. Ms Deacon, a former Labour MSP who served as health minister, said she would not comment on these investigations, but would be looking "very, very carefully at the cases that are live" when she takes up her new role. She said: "I have to take issue with the notion that our police service itself is in crisis. Policing is continuing in Scotland. "I, for one, do not doubt for a minute the challenges that lie ahead both in terms of taking forward and developing our police service, but also in making sure there is an SPA that the public, politicians and others can have trust and confidence in. "From tomorrow, that's my job, to make improvements in that area." Earlier this week, Justice Secretary Michael Matheson insisted the country's police force was operating as normal. He said recent events at Police Scotland had caused "understandable concern" but that the public should still have confidence in the force. Opposition parties have accused Mr Matheson of complacency and urged him to take responsibility for the issues within Police Scotland. The SPA's previous head Andrew Flanagan resigned under heavy criticism from MSPs. Ms Deacon told BBC Scotland the fact that there had been so much attention on the inner workings of the authority was "not a good place to be". She said improvements had to be made in the leadership and governance of the SPA. She added: "It is really important that the SPA is seen to work effectively so that it can play its part in driving forward change and improvement in the police service in Scotland." Responding to her comments, Deputy Chief Constable Iain Livingstone, who postponed retirement to take over the leadership of Police Scotland while the allegations against Chief Constable Gormley are investigated, said: "I'm reassured by Ms Deacon's commitment to driving forward change and improvement at the SPA. "I'm looking forward to working with her as I continue to focus on delivering day-to-day policing for the people of Scotland." In an interview with a Sunday newspaper, the acting head of Police Scotland called for policing to return to being an "apolitical public service" with less political interference. DCC Livingstone told the Scotland on Sunday it could make it difficult for officers if policing was "moved around as a political issue".